Endow ed with not only natural beauty but one of the area’s most peaceful spots, Tra Su Cajuput Forest located in Van Giao Commune, Tinh Bien District is an ideal tourist location which woos a great number of visitors to the southern province of An Giang. Located around 10 kilometers from the Cambodian border, Tra Su is a specialized forest stretching out 1,500 hectares, which connects to other destinations such as Cam Mountain, Sam Mountain, Tuc Dup Hill and many others. This forest has a lot of potential to develop ecotourism, outdoor activities, and exploration as well as giving scientists a chance to learn and research the local environment and typical ecological system of the southern region. Recognizing the importance of protecting cajuput forest and developing many types of tourism, in 2008 An Giang Province upgraded and expanded the 3.4km-long Muong Tien Road with an aim to help travelers visit the forest by land and by waterway. Besides, the province boosts investment in infrastructure for cajuput forest management and protection, and for tourism. Tour guides here say that every year, the forest receives around 10,000 visitors, and the best time to pay a trip is from September until before Tet (Lunar New Year) when water covers the whole area of the forest, giving the natural destination such unforgettable landscapes. The most interesting feature here is that tourists travel by motor-boat or dinghies as they weave through the forest. Passengers will enjoy enormous emerald-green duckweed that blankets the water’s surface, as well as flocks of white storks that perch on cajuputs together with many kinds of birds, animals and fish. Sometimes, the boatman stops the boat and shows tourists some of the huge beehives that rest on the top of the trees. 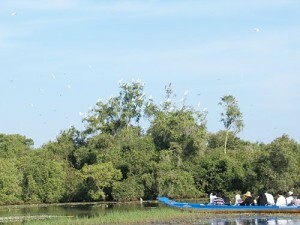 After sitting in the motor-boat for 40 minutes to contemplate the natural sights, travelers will take to the rowing boats or dinghies to see birds and storks return home and build nests. Tra Su is home to 140 flora types, 70 species of birds, 11 types of animals, 20 species of reptiles, and 22 kinds of fish, to name just a few. The deeper tourists go into the forest, the more attracted they are to duckweed, lotus and water lilies. The forest’s edge is quite silent while the inside is bustling and lively due to the poetic sounds of the animal world. Occasionally, several storks will perch on the water surface, and stroll around the roots of trees to search for food. Tourists have to walk on foot for half an hour to climb the 25 meter-high tower to watch the whole forest of Tra Su. It is a real windy spot up high, but it gives visitors the chance to contemplate the Seven Mountain Range, the green blankets of flora, and Ket, Cam and Co To mountains. If you are on a tour to Tra Su arranged by local tour operators, you will have the opportunity of visiting the villages of Khmer and Kinh people around the forest where you will have a chance to see traditional crafts such as brocade and Khmer silk, sugar-making from palmyra, honeybee collecting, and cajuput oil extracting. To reach Tra Su, tourists face a 300km-long journey from HCMC. After arriving in Long Xuyen City, they travel 100km to reach the forest after turning into Chau Doc Township and Nha Bang Town. Or from Chau Doc, visitors can drive motorbikes to Tri Ton and when near Bung Tien Bridge, they make a left turn. Going some 3.5km, they will touch Tra Su Forest. To travel around Tra Su, passengers can use motorbike, bicycle, boat or dinghy.